Insert name participant for each card purchased. The workshop Incentives & Congresses home to about 20 Meeting Planner e PCO of the main Italian companies interested in the offer Meetings, Incentives, Conferences, and Events. The Italian buyers seated at round tables meet hotels and conference venues in the Italian offer workshops to the salon hall 3 to develop business travel, incentive trips and organizing special events. 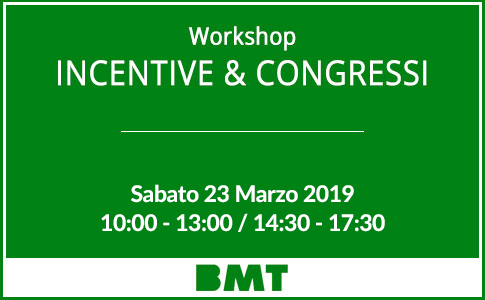 The participation fee of 350,00 EURO It entitles you to 1 entrance card to the workshop and Pizza at Pizzeria BMT Ticket valid during the break of 13:00. Each additional card costs € 175.00. To be present in the workshop catalog that will be delivered to buyers is essential to regularize enrollment within Friday, March 1, 2019.